NLC from the engineering graduates of Mechanical, Electrical (EEE), Electrical (ECE), Civil, Control & Instrumentation, Mining and Computer. 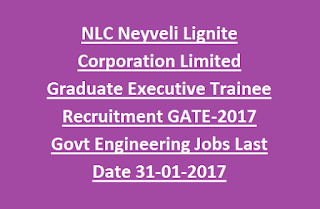 Selection for this NLC Executive Trainee Jobs recruitment will be based on merit in GATE 2018 marks. Those candidates who are going to appear for the GATE-2018 the can apply for this NLC ET jobs online from 16-10-2018 to 25-10-2018. 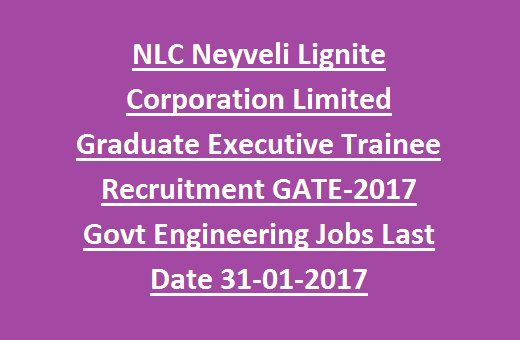 For more details of NCL Executive Trainee GATE 2018 Jobs see the information given below. There are total 100 vacancies available in NLC for Graduate Executive Trainees. For gender balance female candidates are encouraged to apply by Neyveli Lignite Corporation Limited. Should not have completed 30 years as on 01-12-2018. Upper age limit is relaxable for OBC candidates is 3 years and for SC/ST candidates is 5 years. The candidates must have qualified Bachelors Engineering degree of B.E/B. Tech with 60% marks for UR candidates and for OBC/SC/ST candidates 50% or marks in their relevant engineering discipline. GATE 2017 qualifying is mandatory. One year training will be provided for GET candidates of NLC. Selection for this NLC Recruitment will be held based on marks secured in GATE 2018. Candidates who is going to appear for GATE 2018 those candidates may apply online for this Graduate Executive Trainee posts from 00-00-2018 to 00-00-2018. Online applications will be received through the official website of NCL @www.nlcindia.com.